P. Daniel Smith, who announced the move in an email sent to all NPS employees Friday, will remain in his post as acting director. In November, many considered Vela, the former superintendent of Grand Teton National Park in Wyoming, a shoo-in for the top job after the Senate Energy and Natural Resources Committee voted overwhelmingly to advance his nomination. But the nomination then languished in the full Senate, which declined to take a vote. When a new Congress convened in January, Trump would have had to renominate Vela to keep him in the running, but that never happened. Vela, a Texas native who described himself as the oldest grandchild of a sharecropper at his confirmation hearing, would have been the first Latino to head the agency in its 103-year history. As director, he said one of his top goals would have been to end "the scourge of sexual and workplace harassment" in the Park Service. The agency has been without a permanent director since January 2017, when Jonathan Jarvis left the job. Jarvis served as director for eight years under President Obama. Vela has a long track record with the Park Service, having worked in other positions as the agency's associate director for workforce and inclusion; the director of the NPS Southeast region; and superintendent of the George Washington Memorial Parkway, Palo Alto Battlefield National Historic Site and Lyndon B. Johnson National Historical Park. In his email to employees, Smith said he and Vela would be "working closely with our entire National Park Service team to support the remarkable work that you are doing across the country." "Many of you have already worked with David and seen his leadership in action," Smith said. "Those of you who haven't will quickly see how important our workforce is to him." 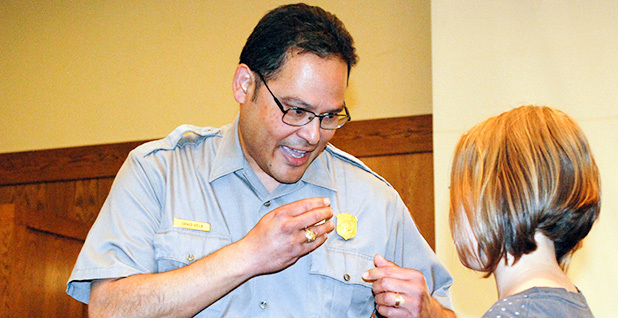 Vela's relocation to Washington is the latest in a series of high-profile moves to hit the top ranks of the National Park Service in the past year. Former Yellowstone Superintendent Dan Wenk and Sue Masica, who led the Denver regional office, both left last summer rather than accept reassignments ordered by Smith and former Interior Secretary Ryan Zinke. Lizette Richardson, the superintendent of Lake Mead National Recreation Area in Nevada and Arizona, joined them in July when she announced she would retire rather than move to Denver to lead the NPS Intermountain Regional Office. The leadership juggle hit Grand Canyon National Park last month when Superintendent Chris Lehnertz resigned after leading the park for only two years. Her replacement has not yet been named.